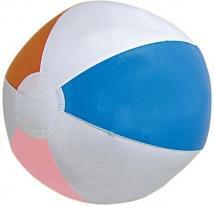 6" Beach ball, Beachballs are measured as follows: inflated, half the circumference. Imprint area : 2" w x 1" h Packing / Shipping weight : 300 per case/15 lbs. 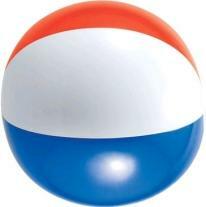 6" Beach ball. 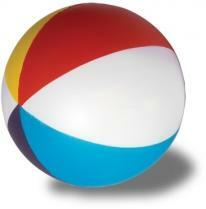 Beachballs are measured as follows: inflated, half the circumference. Imprint area : 2" w x 1" h Packing / Shipping weight : 300 per case/15 lbs. 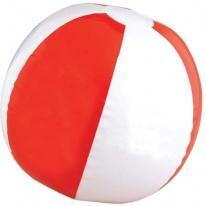 12" Red / White Beachball, Beachballs are measured as follows: inflated, half the circumference. Imprint area : 3-5/8" w x 2" h or 3" w x 2-1/4" h Packing / Shipping weight : 300 per case/30 lbs. Beachball has 6 panels, Beachballs are measured as follows: inflated, half the circumference. Imprint area : 4" w x 2" h or 3" w x 2-1/2" h Packing / Shipping weight : 288 per case/30 lbs. 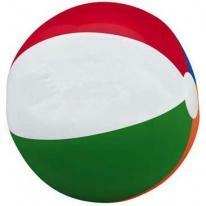 12" Beach ball, Beachballs are measured as follows: inflated, half the circumference. Imprint area : 3-5/8" w x 2" h Packing / Shipping weight : 300 per case/30 lbs. 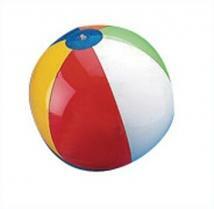 Beachball has 6 panels, Beachballs are measured as follows: inflated, half the circumference. Imprint area : 3" diameter. Packing / Shipping weight : 288 per case/30 lbs. 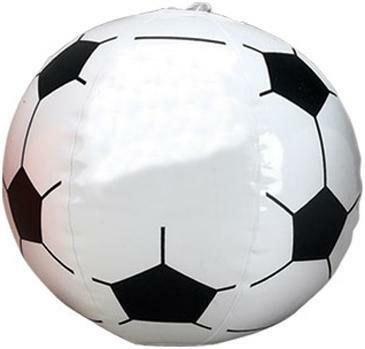 16" Football inflate (measured tip-to-tip) great for picnics and tailgating, Beachballs are measured as follows: inflated, half the circumference. Imprint area : 4" w x 2" h Packing / Shipping weight : 300 per case/35 lbs. 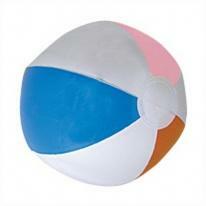 16" Beach balls for sports fans, Beachballs are measured as follows: inflated, half the circumference. Imprint area : 3" w x 2" h Packing / Shipping weight : 300 per case/30 lbs. 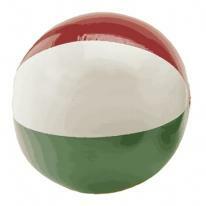 16" Beach balls for sports fans, Beachballs are measured as follows: inflated, half the circumference. Imprint area : 3-1/2" w x 2-1/2" h Packing / Shipping weight : 300 per case/30 lbs. 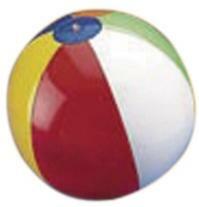 Beach Ball has 6 panels. 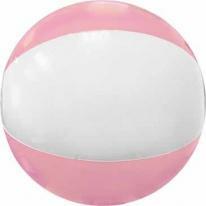 Beachballs are measured as follows: inflated, half the circumference. 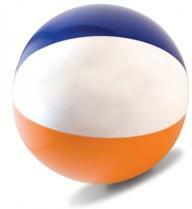 Our Beachballs are Phthalate Safe. Imprint area: 3-5/8" w x 2" h or 3" w x 2-1/4" h Packing / Shipping weight: 288 per case/30 lbs. 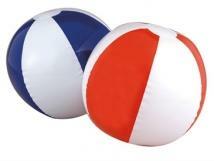 Sport Beach Balls are made of a durable vinyl, available in six sports. Feature and air-catch valve for easy inflation. 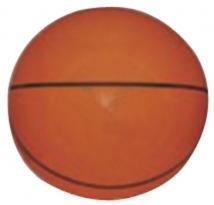 Size:16" measured from pole to pole compared to a basketball. 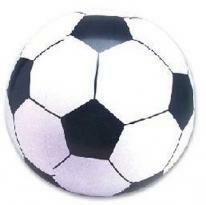 Imprint Area: Football: 4 1/4" W x 2 1/4" H Soccer: 2 3/4" diameter All Others: 3 7/8" diameter. Packaging: Packed in bulk. Styles: Golf. Volleyball, Soccer, Basketball, Baseball, Football. Note: Do not inflate using an air compressor. 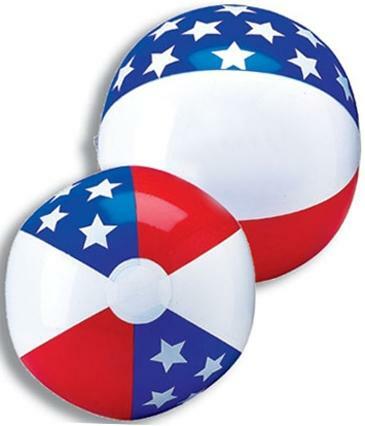 Inflatable Multi-color beach balls add bounce to your summer promotions. Each ball is printed with the following warning to meet the CPSIA requirement. Product Size: 11" diameter / 15" Uninflated Imprint Area: 2 1/2" x 3 1/4" Packaging Dimensions: 20"(L) X 16"(W) X 10"(H) Units Per Box: 250 Shipping Weight: 31 lbs. 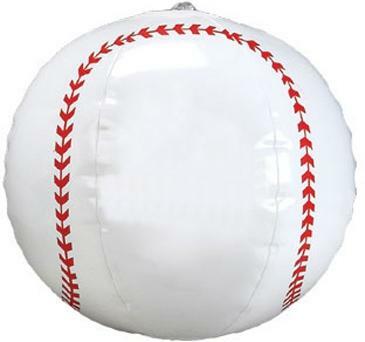 16" inflatable ball for sportfans, Beachballs are measured as follows: inflated, half the circumference. Imprint area : 2-1/4" w x 2" h Packing / Shipping weight : 300 per case/30 lbs. 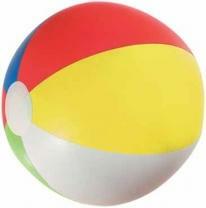 Assorted color, fancy beach ball with heavy weight vinyl and polka dots, Beachballs are measured as follows: inflated, half the circumference. Imprint area : 4-1/2" w x 1-1/2" h or 4" w x 2" h Packing / Shipping weight : 150 per case/20 lbs. Our multi-color Beach Balls come with 6 panels. Only 1 color imprint on white panel. Size: 16" tip to tip Imprint: 5 1/2" x 2 1/2" Packaging: Bulk Weight: 25 1/2 lbs/150 pcs. Re-inflatable and re-usable vinyl fan-ta-sticks noisemakers make events come alive when the two sticks are banged together. Color Registration: Mis-registration up to 1/4" in any direction. Exact registration cannot be guaranteed. Size: 23"W x 4"H Imprint Area: 15"W x 3 3/8"H Packaging: Packed in bulk. Note : Do not inflate using an air compressor. Great for sporting events Large imprint area Includes instructions for inflation Blow-up straw included 4 Colors available. Actual Size: 23" H x 4-1/2" W Imprint Area: 17-7/8" H x 3-3/16" W Packaging: Bulk. Straws included in each box Shipping Weight: Approx. 11 lbs. per 250 pairs. 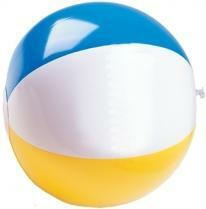 15'' Inflatable Beach ball No-Leak Valve Made of PVC Bulk packed. 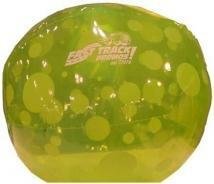 Size: 15'' Diameter Max Imprint Area: 4'' W x 2'' H WT_100: 12 LBS. Paper-Proof: $10. (Required on all labels). 20:10. 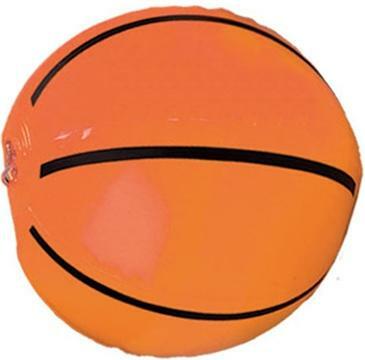 High quality soft vinyl mini basketballs feature a re-inflatable athletic valve. 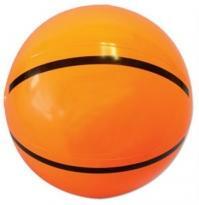 Vinyl basketballs are softer, safer and larger than traditional mini basketballs. 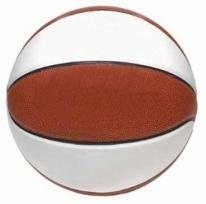 Our superior vinyl basketballs are great game day fun! Color Registration: Mis-registration up to 1/8" in any direction. Exact registration cannot be guaranteed. Size: 4 1/4" diameter can vary from 4" -5" in diameter Imprint Area: 2 1/2"W x 1 1/2"H or 2 1/4" diameter Packaging: Packed in bulk. 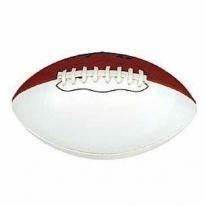 High quality soft vinyl mini footballs feature a re-inflatable athletic valve. Our superior vinyl footballs are perfect for boosting team spirit. 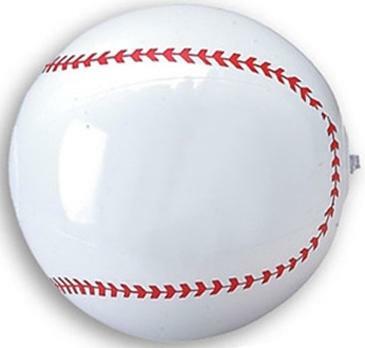 Product Size: 7" measured with arc of ball. Imprint Area: 2"W x 1 1/2"H or 2" diameter. Packaging: Packed in bulk. 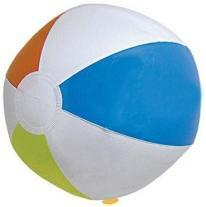 24" Beach ball, Beachballs are measured as follows: inflated, half the circumference. Large imprint area : 4-1/2" w x 1-1/2" h, or 4" w x 2"h Packing / Shipping weight : 300 per case/30 lbs. 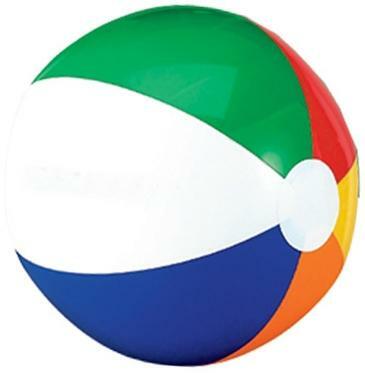 This six-panel, multi color beach ball is sure to bring hours of fun! Product is CPSIA compliant. Size: 10-1/4" dia. 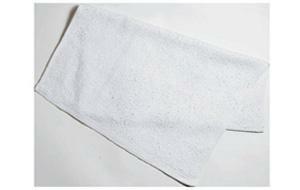 Imprint Area: White Panel (Standard): 3-3/8"w x 2-3/4"h, 1 color(s) max. Packaging: Bulk Pack Of: 185 Weight: 24 lbs. 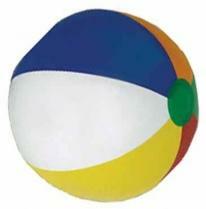 Inflatable multi-colored beach balls. Size : 16" Imprint Size : 6"x 2 3/4". 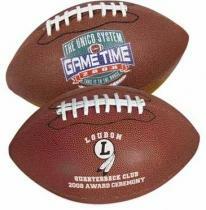 Synthetic Leather Footballs have the look and feel of an official football at an affordable price and low minimum. Featuring re-inflatable athletic valve. 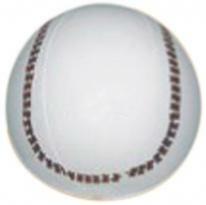 Product Size: 14" measured on the arc of the ball. Imprint Area: 5"W x 3"H or 3" diameter Packaging: Individually polybagged. Baden Football with autograph panel. Imprint Area: 5" x 2". New Wilson full size (SFABW) basketballs with autograph panel. 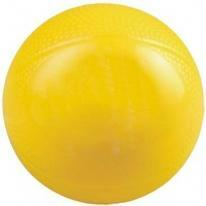 Baden full size basketball (SFAB) also available. 1 color imprint only. Imprint Size Sfabw/Sfab : 5"X 2" 2Nd Panel Imprint : 1.67.